This page highlights some of the many Bucklins who have written books or articles, who were noteworthy either for the written material itself, or for aspects of his/her life concerned with the publication. Harold Stephen Bucklin (1886-1967) published a series of articles surveying the agencies that dealt with disadvantaged children. As you may guess from that statement, he was a professor of political science and sociology. But what is truly remarkable about him (and his wife) is his trip (with his wife and two year old son Donald) to China long before it was a tourist destination. In 1923-24 he went to China with the Brown-in-China program as professor of sociology at Shanghai College. 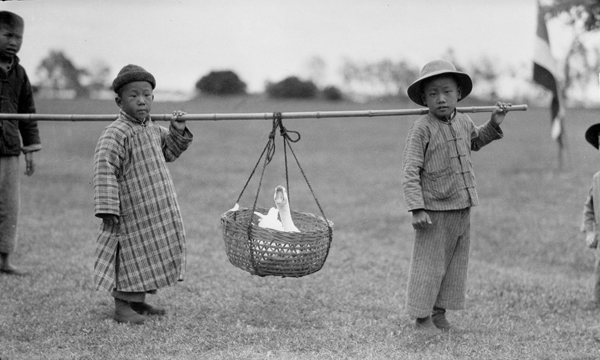 A wonderful view of the photos he took documenting social conditions and his China trip is found at a site established by Donald Bucklin, where you can order photos, such as the one below. Harold was born in Pawtucket, Rhode Island on November 4, 1886. He graduated from Brown University in 1910, received his Master of Arts degree in social work, in 1915 from the New York School of Social Work, where he received a master of arts degree in 1915, and earned his Ph.D. degree in 1918 at Brown University. He was named assistant professor in 1918, associate professor of social science in 1926, associate professor of sociology in 1929, and full professor in 1949. He was chairman of Sociology within the Department of Political Science and Sociology in 1946, and from 1947 to 1948 chairman of the separate Department of Sociology, retiring in 1951. In Rhode Island he served as chairman of the Americanization Commission in 1919 and member of the Children’s Law Commission in 1926 and of the Juvenile Court Commission in 1938. “I’ll Ask My Grandmother, She’s Very Wise” and “Angel in the Senate” both by Kristen Ingram, a Bucklin descendent, are two of her over 17 books and over 2000 (really) magazine articles. Kristen wrote about our ancestor William Bucklin, who came to America in 1630. We are two “ordinary” women who feel that women’s friendships can be extraordinary…..We also share the hope of making a difference in other people’s lives. The feedback we’ve already received from family, friends, and other early readers encourages us that this book may indeed be doing just that. “The Complete Guide to Nonprofit Management (Nonprofit Law, Finance, and Management)” by Smith Bucklin & Associates. The classic for nonprofit organizations, by one of the largest professional managers of nonprofit corporations. Addresses virtually every nonprofit business management issue. This is a “five star” rated book by reviewers in the field. “The Killer Angels” by Michael Shaara (1974) is a popular book about the Civil War. If you are from Maine, are a Bucklin, and are interested in the Civll War this is the book for you. The author claims that the history is accurate and taken from letters and documents of the period, but the dialog and characterization is his interpretation. In one chapter, Joseph Bucklin, wounded and tired of war, one of 180 Maine soldiers that are the subject of an order to be shot for not pressing onward, keeps fighting for freedom as an ideal. “The characteristics of initial effluent quality and its implications for the filter to waste procedure” by noted environmental engineer Karen Bucklin. Although sewage does not make a book topic that ever will hit the Times best seller list — the research by Karen Bucklin resulted in some of the present standards for waste water treatment and offers insight for designers of waste water plants.